Colonel William Light’s Plan of Adelaide, 1837. History SA, HT2001.166. Colonel William Light was appointed by the South Australian Colonization Commissioners in February 1836 as South Australia's first surveyor-general. He was both a soldier and a sailor, ably captaining the Rapid on its journey to South Australia, where he arrived in August 1836. Light’s task in the new province was an impossible one. He was required to survey more than 2400km of the coastline and surrounding countryside in detail, determine the ‘best situation’ for the principal settlement, survey the town site, divide 150 square miles (c. 390km2) of country into sections for farms and reserve areas for country towns – all within two months or so before the first colonists were expected to arrive. His deputy surveyor, George Strickland Kingston, did not arrive in the settlement with the other staff until September 1836, although he left before Light, and the teams were also hampered by poor equipment and no provision for transport. Not surprisingly, Light could not complete his many tasks in time. Walked over the plain to that part of the river where Mr Kingston had pitched his tent, with a small party of surveying labourers. My first opinions with regard to this place became still more confirmed by this trip; having traversed over nearly six miles of a beautiful flat, I arrived at the river, and saw from this a continuation of the same plain for at least six miles more to the foot of the hills under Mount Lofty … affording an immense plain of level and advantageous ground for occupation. On 29 December he fixed the precise location of the future city and by March of the following year he had completed his survey of Adelaide, laying out its 1042 'town acres'. Light’s preference for the site of Adelaide was subject to continuing controversy. Early settlers camped at Holdfast Bay at first suggested that location for the principal settlement, but soon came around to Light’s view. Others, including irascible Governor John Hindmarsh, argued at different times for Port Adelaide, Port Lincoln, Victor Harbor and Rapid Bay. The process and endless argument took considerable toll on Light, who was already suffering from the advanced consumption, or tuberculosis, that would ultimately claim his life in October 1839. In A brief journal of the proceedings of William Light published at his own expense in May 1839, Light wrote that 'The reasons that led me to fix Adelaide where it is I do not expect to be generally understood or calmly judged of at present … I leave it to posterity … to decide whether I am entitled to praise or to blame'. Various version of Light’s plan for the city exist, but only two original plans drawn in 1837 are known to have survived. One is in the State History Collection (illustrated) managed by History SA. It is a watercolour and ink plan, drawn by 16-year-old draughtsman Robert George Thomas to instructions from Light. It shows the distinctive grid pattern of the streets and squares in the city’s so-called 'square mile', and nearby North Adelaide, and indicates the surrounding parklands so beloved of South Australians. The River Torrens divides North Adelaide from South Adelaide (as the present Central Business District was originally known). The streets were named by a Street Naming Committee that met on 23 May 1837, indicating that this plan must have been completed after that date. Light’s plan of Adelaide in 1837 is widely acknowledged to be an early example of enlightened city planning. 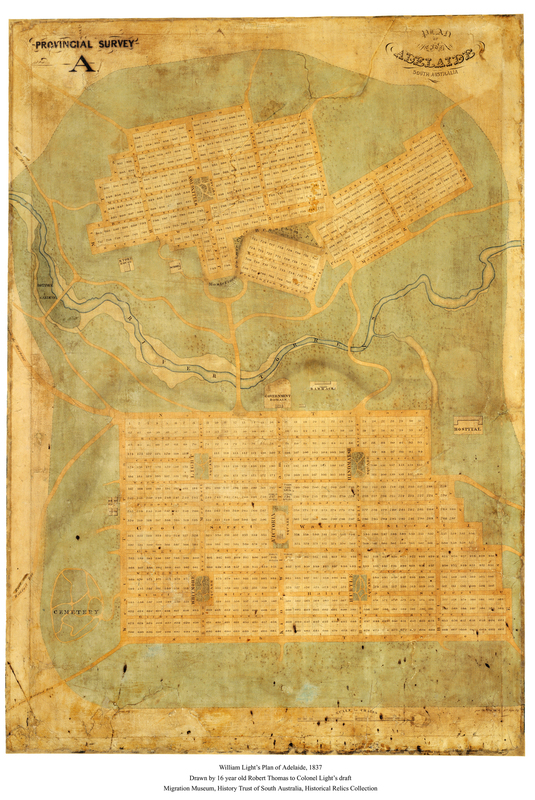 Margaret Anderson, History Trust of South Australia, ‘Light's Plan of Adelaide 1837’, Adelaidia, History Trust of South Australia, http://adelaidia.sa.gov.au/panoramas/lights-plan-of-adelaide-1837, accessed 21 April 2019. The real 'original' map of the plan which must have been available to potential purchasers in March 1837, at the time of the auction of the available Town Acres, would not have had any named streets or squares. Despite diligent searching, I have never been able to discover this map, or a copy of it - possibly it was destroyed at the time of the fire which engulfed Light's office in the Park Lands. One copy would certainly have been sent to the Colonization Commissioners in England, but this may not have occurred until the streets were named, thus not an 'original' copy. I am interested in this due to a remark made by Town Clerk Worsnop in a debate with Sir George Kingston, in which Worsnop stated that the Squares were depicted by dotted lines - something which, as far as I know, none of the existing copies show.